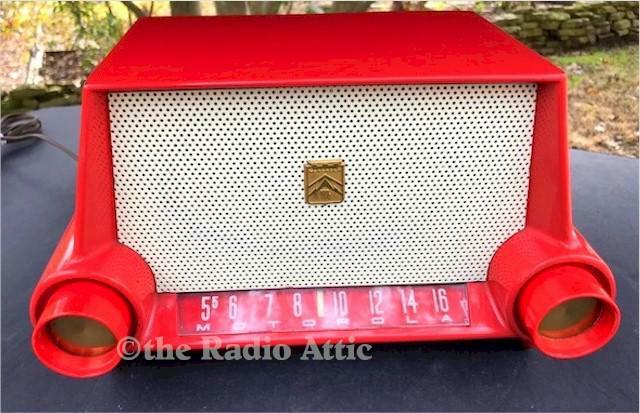 Motorola Retro atomic designed radio from 1954 in a beautiful fire engine red Bakelite case. This case retains its original red paint, and it is in near perfect condition. No cosmetic issues, no cracks or chips. The radio was produced in several colors, but the red is definitely the most striking. The original back is on the set, and the radio's chassis has been completely gone over by a professional and is playing very well picking up all my local AM stations without any problem. It has its original knobs with brass knob inserts in place. This is a fantastic Retro Motorola radio in a beautiful bright color. About 11-1/2"W x 6-1/2"H x 7"D (to end of the knobs).